As the United States commemorates the centennial of the country’s active engagement in World War I, a new book tells the larger story of that conflict through the individual stories of its most valiant and emblematic soldiers. 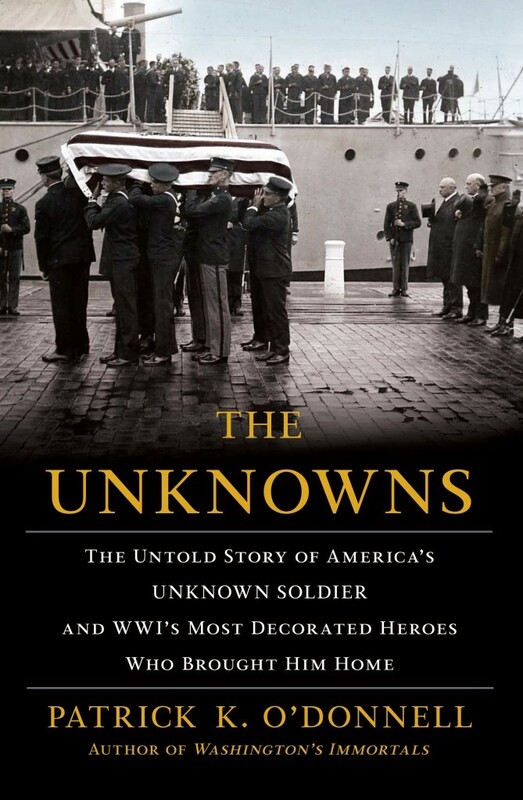 For the first time, bestselling author Patrick K. O’Donnell provides a narrative history of the Tomb of the Unknown Soldier and the battlefield exploits of the hand-selected Body Bearers who laid him to rest in THE UNKNOWNS: The Untold Story of America’s Unknown Soldier and WWI’s Most Decorated Heroes Who Brought Him Home. With the same “seamless blend of tactical acumen and human drama” (The Wall Street Journal) that he brought to his last book, Washington’s Immortals, O’Donnell brings the brutal combat of the Great War vividly to life. Each Bearer, selected by General John J. Pershing, Commander of the American Expeditionary Forces (AEF), represented a different branch of the military, and most of them fought in all the major battles in which the AEF participated. “Pershing’s Body Bearers were some of the most decorated, intrepid enlisted men who fought in World War I,” O’Donnell writes. “They uniquely span America’s service branches and specialties, uncovering an untold story within a forgotten story: Army, Navy, Marines, Infantry, Cavalry, Field Artillery, Heavy Artillery, and Combat Engineers.” Their experiences highlight the necessity faced by Pershing and the AEF to abandon obsolete field tactics in the face of novel and devastating new technologies. THE UNKNOWNS narrates their stories chronologically through the war in gripping detail, telling the larger story of America’s involvement in this bloodiest of conflicts, and of the birth of a modern U.S. military. Great care was given to the selection of eight men who would serve as Body Bearers for the Unknown Soldier when he was laid to rest at Arlington. The secretary of war sent letters to the service branches, and they culled through thousands of citations and selected more than one hundred men as possible candidates hailing from each major branch of the service. It was then left to General Pershing to make the final selection. Chief Gunners mate James Delaney: A tough Irishman from Boston in command of a naval gun crew on board the SS Campana. When it was sunk on August 6, 1917, in one of the first hostile acts toward the U.S. after war was declared, he and several crew members were taken prisoner and held on a German U-boat for nearly two weeks. Mistakenly reported as dead, he was then held in captivity for a year in the harsh environment of a German prisoner of war camp, all the while refusing to provide information to the enemy. He emerged as what O’Donnell describes as a “walking scarecrow,” having lost a significant portion of his body weight by the end of the war. Gunnery Sergeant Ernest A. Janson: Born in New York City, he was among the first American ground troops deployed to France, a member of the 49th Company of the 1st Battalion 5th Regiment Marines, and was attached to the hastily assembled 1st Division (Regulars). He arrived on the front lines in May 1918 and fought outside Belleau Wood in one of the first battles involving U.S. troops. Janson and his brigade went on the offensive on June 6 on what would prove to be the bloodiest day in the 143-year history of the U.S Marine Corps to that point. When the then-40-year-old leatherneck caught sight of more than a dozen Germans setting up five machine guns to annihilate his company, he charged them with only his bayonet, while at the same time alerting his company. Although severely wounded, his daring charge saved the 49th and the key position of Hill 142. For his bravery and disregard for his own safety, he would become the first recipient of the Medal of Honor for the AEF, among many other awards. Color Sergeant James W. Dell: Born in Henry County, Kentucky, he was a member of the U.S. Army Field Artillery decorated for valor outside Soissons, France. By the time of the Battle of Soissons (the French called it the “Second Battle of the Marne”) in July, he was a battle-hardened, gray-haired, forty-one-year-old veteran with more than twenty years of service to his credit. Dell served in the Headquarters Battery of the 15th Field Artillery Regiment, manning the horse-drawn lighter cannons that accompanied the army onto the field of Battle. Dell and his regiment advanced behind the infantry to provide close support. He distinguished himself and was cited for gallantry in the general orders. Corporal Thomas D. Saunders: A Native American of the Cheyenne tribe from Medicine Bow, Wyoming. He and his fellow 2nd Regiment engineers embarked on suicide missions as they literally crawled through the mud with heavy, two-handed wire cutters, snipping barbed wire to allow Americans and Allies to advance. They braved constant sniper and machine-gun fire, becoming some of the first men to cross into German lines at the attack at St. Mihiel. He and a partner took 63 prisoners, an astounding achievement for which he eventually received the Distinguished Service Cross and the Croix de Guerre. He later distinguished himself at the attack on Blanc Mont Ridge, October 7-8. Saunders was one of approximately ten thousand Native Americans who served in the U.S. Forces in World War I, only a decade after their fathers and grandfathers had fought the U.S. Army in the west. Chief Water Tender Charles Leo O’Connor: A Cambridge, Mass., native who toiled in the intense heat of the cavernous steel bowels of USS Mount Vernon, a former German ocean liner that had been seized by the U.S. government and converted into a troop transport by the Navy. On September 5, 1918, a torpedo struck them amidships, not far from O’Connor’s position. Although nearly fatally burned by the explosion, he immediately set about doing whatever he could to save the ship. Staggering in the swirling water, he struggled to his feet and closed a watertight door leading to a large coal bunker behind him. O’Connor would bear painful scars for the rest of his life. However, his self-sacrifice likely saved the ship and the lives of his fellow crew members. He spent a month in sick bay recovering from burns and was released in time to ferry troops back home across the Atlantic. First Sergeant Harry Taylor: a cowboy and master sergeant with U.S. Army headquarters troop (cavalry) who spent his entire career in the saddle after enlisting in Fort Yellowstone, Wyoming in 1901. A model soldier, Taylor earned a reputation as a crack shot with a pistol and an expert with the saber. His skills were anachronistic in the age of the machine gun and heavy artillery, but his leadership abilities were still highly valuable. His was known as the “Wild West Division,” made up of farmers, loggers, ranchers, cowboys, filmmakers and others from nine western states and the Territory of Alaska. They entered the fray on September 26 in the Meuse-Argonne. Through a series of attacks and counterattacks, they saw some of the bloodiest fighting of the war, and scores of men in the division were killed. For his hand-to-hand combat in the town of Gesnes, Taylor received a Citation Star, an honor later known as the Silver Star. Sergeant Samuel Woodfill: a U.S. Army regular who hailed from Bryantsburg, Indiana. Never one to ask his men to do anything he would not do himself, Woodfill made a mad dash for the woods in the Meuse-Argonne and single handedly took out three machine gun nests that were threatening his company. Even after running into a patch of mustard gas, he pressed on deeper into German lines. O’Donnell’s account of the incident reads like an action-adventure, with Woodfill slaying German soldier after German soldier. He was considered by Pershing to be one of the greatest solders of the AEF and was awarded the Medal of Honor. First Sergeant Louis Razga, a member of the Coast Artillery Corps, who was born in Turoczent Marton, Hungary, enlisted in 1909 and was pulled from U.S. coastal protection duty to head to the fight in France. He and his fellow soldiers manned twelve-foot howitzers that topped ten tons, and shot high explosive two hundred-pound shells nearly six miles. He served close to the front lines in October 1918, with little sleep and nearly constant shelling. He was gassed in the final days of the war. The Unknown Soldier himself was chosen with great care, with extraordinary measures taken to ensure that his identity could not be established. Both the French and the British had developed plans to honor their own Unknown Soldiers, which helped stir public support for a similar monument in this country. Brigadier General William D. Connor, who replaced Pershing as commanding officer of the American Forces in France first brought the idea to the fore. After news coverage of the French and British ceremonies in 1920, The New York Times got behind the idea with a column suggesting a tomb at Arlington National Cemetery. New York Representative Hamilton Fish, who had served as a Captain in the 369th U.S. Infantry Regiment, introduced legislation to establish it. Public support for the idea overcame opposition in the Senate and on February 4, 1921, Congress approved Public Resolution 67, which called for the construction of a simple tomb for an unknown soldier at Arlington. In one of his last acts as President, Woodrow Wilson signed the bill just hours before leaving office on March 4, 1921. In October 1921, at four U.S. military cemeteries in France, embalmers exhumed remains of unidentified soldiers that had been selected at random. Had they found anything that might have led to a name (dog tags, personal items, etc. ), they would have selected an alternate. Each body was placed in an identical casket with no marking to note its origin, and all four were brought to the city hall of Chalons, where Sergeant Edward F. Younger, a wounded veteran and Chicago native, had been selected to determine the final choice. O’Donnell recounts in detail the carefully planned days of November 9-11, 1921, when the body of the Unknown Soldier arrived in Washington from France aboard the USS Olympia on the Potomac, laid in state in the U.S. Capitol, and was transported to its final resting place in Arlington on the third anniversary of the Armistice ending the war. Tens of thousands of people lined the streets to watch the procession, led on foot for five miles by General Pershing. Tags Allies, American, American Expeditionary Force, Americans, arlington national cemetery, army, artillery, Band of Brothers, Battle of Fallujah, battlefield, BBC, Belleau Wood, British, cannon, cavalry, center of military history, Cheyenne Tribe, CIA, Company E, Distinguished Service Cross, Dog Tags, EAM, espionage, Falluja, France, French, general, German, Germans, halo, HBO, Howitzer, howitzers, Hungary, india, Intrepid, james, John J Pershing, Kentucky, machine gun, Marines, Marne, medal of honor, Memorial Day, Meuse, Meuse-Argonne, military, military historian, military history, Morat, Mustard Gas, navy, New York, Ney, Odo, OSS, POW, riga, saber, sam, Second Battle of the Marne, Silver Star, Sniper, special operations, Tern, The Division, Thor, torpedo, Tory, U-Boat, United States, US Army, us military, USS Olympia, Veterans Day, WIN, Woodrow Wilson, World War I, world war one, wounded, WWI.